PEAK BARDAN specially controls red spider mite (Oligonychus coffee) in tea plants. It reduces pest load in plantations/agro-ecosystem and provides a strong support to Eco friendly/organic agriculture. PEAK BARDAN controls spider mite and also other pests such as thrips, aphids, leaf roller, flush worm, tortrix and other caterpillars. 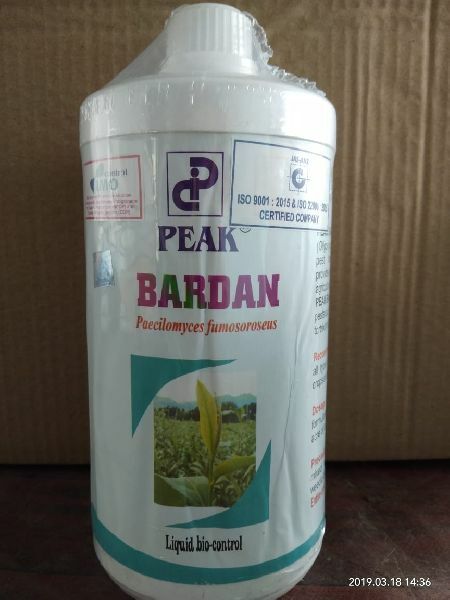 Recommended for : PEAK BARDAN is used on all types of vegetables, field crops, horticulture crops and oil seed crops. Dosage & Applications : Dissolve 200 ml of the formulation in 200 liters of water and spray in one acre of land using hand operated Knapsak Sprayer. Precautions : PEAK BARDAN should not be mixed with chemical insecticides, fungicides, weedicides.